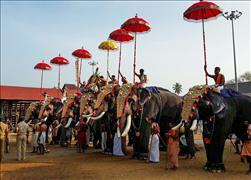 Vaikom in Kottayam district of the southern state of India, Kerala, is one of the main pilgrim centres of the south. Famous for the Vaikkath Asthami celebrations in November/December, it is one of the few temples which is held in reverence by both Shaivaites and the Vaishnavaites. Vaikkom’s Shiva is fondly called Vaikkathappan. The Shiva Linga here is believed to be from the ‘Treta yuga’ and considered as one of the oldest temples in Kerala where pooja has not been broken since inception. Vaikathashtami, observed in the Malayalam month Vrishchikam on the eight day after full moon day, is one of the most popular temple festivals in Kerala. Vaikathashtami 2018 date is November 30. 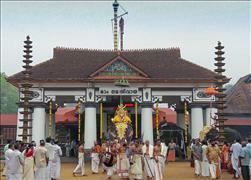 The festival is held at the famous Vaikom Mahadeva Temple at Vaikom near Kottayam in Kerala. Lord Shiva is worshipped here in the form of a Shivling, which is believed to have been formed during the Tretayuga. I'm Anandhi from Chennai. 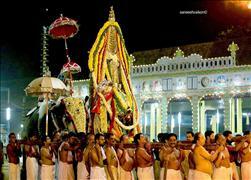 Lord vaikathappar is our family deity. We have planned to visit the temple on 26th January 2019. I need to book abishegam for lord vaikathappar on the same day. Kindly guide me whom should I contact. Kindly let me know whether devassom accommodation will be available from 9..12.2017 to 11.12.2017 (both days inclusive) as I am planning visit to Vaikom Kshehram on these days. This is a glorious temple, my first visit to a temple and my first visit to India. I was stunned by the beauty, spirituality, and grace. The worshippers were kind and very helpful. I want visit on 9th November. Pl let me know your accommodation tariff details & availability of the same date. I WISH ALL SUCCESS TO ALL THE DEVOTTEES. GREETINGS AND THANK YOU. PLACE OF ETERNAL PEACE. LORD SHIVA MAKES FACE TO FACE INTERACTION AND LISTENS. Wonderful and a very informative site. Appreciate if you could kindly provide more information about the holy ash which is given as prasad. 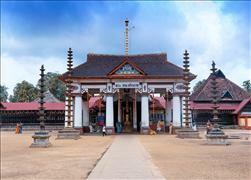 Vaikom is an ancient, world famous temple. But still Travancore Devasom Board is living in an ancient era. TDB should implement online pooja booking facilities on atleast the very famous temples like Vaikom, Chettikulangara, Guruvayoor, Ettumanoor etc. TDB has lot of money and if they provide these facilities more revenue will generate and it can be used for the well being of temples and its activities. VERY USEFUL INFORMATION BY DINAMALAR. Namasthe! With the blessing of Shree Vaikom Sree Mahadevar, I want to perform PRATHAL in April or May 2016. Presently we are living in Saudi Arabia. let me know the formalities if any for advance booking. I am from the land of Shree Ettumanoor Mahadevan. A Ragini I want to see the temple in the month of April - 2016 along with my family. Are there any fecilities to stay with family ? KINDLY SUGGEST ME, HOW I CAN DO ONLINE BOOKING FOR POOJA ARCHANA ETC. I want to send my offerings for annadanam. how much should I contribute & how do I send the money ; address is also needed. Sir,can i send by cheque with all details for performing PRATHAL?if so what is the amount and what i should do?I am in coimbatore.Also i would like to send a small donation towards ANNADANA.Please help.Thanks. Pl send me the programme schedule/notice of ongoing festival at there. We like to do dharshan of lord Mahadevar on December 2nd week. Kindly send the details of accommodation available. someone told related to the temple activites that there is an online platform in which I can book the Chorunu function of my son....but .....no such facility is seen here...... is there any such thing? INFORMATIVE. VIDEO GALLERY NEED IMPROVEMENT AND PLACES TO SEE MORE ELABORATE. Shri Vaikathappa Bhagavane Saranam Saranam Saranam Mahadeva. IT IS VERY UNFAIR TO SEE THAT THE PEOPLES ARE TAKING CHAPPALS TO THE CHUTTAMBALAM EITHER BY HAND OR IN POLYTHENE BAGS. DEVOTEES ARE COMING TO TEMPLE FORM ALL OVER THE WORLD. THEY WILL SURELY DISAPPOINTED TO SEE THIS. WE CANT SEE THIS TYPE OF HABITS IN ANY OTHER TEMPLE IN THE WOLRLD DO SOMETHING TO STOP THIS STRICTLY BEFORE THIS YEARS ASTHAMI. Need to book Mrithyunjaya Archana for an year. Please help. sir I am from Vaikom. I almost daily saw some old people situated at the north gate and asking money for food. I know you are given food daily,now it morning too. my suggestion is if they have no home and no one to help them,can we build a shelter home for them. I am feeling bad , in the land ANNADANA PRABHU people suffering such.. if u can please help them.. I want to see the temple in the month of September along with my family. Are there any fecilities to stay with family ? Om Nama Shivaya sir there is no improvement in career and also facing financial problems we want to do some puja's olz help us in this regard. Respected sir there is no improvement in career and also facing financial problems we want to do some puja's olz help us in this regard. I wish to do 'adimakidathal' of my son in vaikom temple. So I want to know the timings. Please send me the timings and the age of my son is 6 months. Is this ok for that offering? Very informative. Simple and neatly worded. Could gather some information about the temple including history of the temple. Thank you. I would like to send some money for Annadhanam , Kindly let me know how can i transfer funds ! Awasome, no words to explain...Suggest everyone to feel the experience.. Temple is well maintained. I enjoyed my visit . Namaskaram, Wish to perform a Bharatanatyam Seva at your Temple. Need the mail id to forward application. Om Namah Shivaya! I want to make a small donation specifically for Annadanam. Is there a possibility to make online payment for such a donation? If so, please give me the bank a/c number and IFSC code. Also, I hope i will get confirmation that you have received the donation. Thank you! I pray to Lord Shiva to enable me to make my maiden visit to this temple soonest. Om Namah Shivaya. Vivaham nadathunatinte formalities enthokeyanen parayamo? OM NAMASHIVAYA......... With devotion and pleasure I crossed over this site and found wonderful and beautiful as it touches every corner of the details regarding this great location in Kerala.Best wishes. om nama shivaya as i cannot read malayalam can you please send me the information on the pooja and how to send money for the same.it will be of great help to me. It is learned that Astbanda Kalasham / Sahasrakalasham etc. starts from Aug.19 or so. If possible please update details in the site or mail to me. 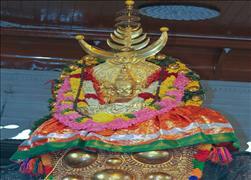 Om Namah Shivaya Sadashiva is known to be wish fulfiller. Hello Sir, Could you please let me know when is Vaikom Ashtami this year Thank you. please send your bank details or your correspondence address or phone temple contact No. 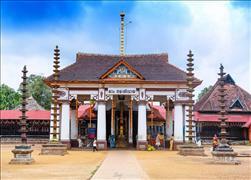 This site is very useful for people to know more about the Vaikom temple. Whenever I come to Vaikom to see the Deity it is inspiring and gives a feel like to see him daily. Such an akarshan. iam very happy and peaceful to see the website. ome namasivaya. I WOULD LIKE TO DO SOME OFFERING IN MY SON'S STAR BIRTH DAY. KINLDY MAIL ME THE OFFERING DETAILS WITH PROCEDURE TO SEND THE FEES. I AM WRITING THIS MAIL FROM SINGAPORE. I WANT TO DO A PRATHAL AND PLEASE LET ME KNOW HOW TO SEND IN THE AMOUNT AND CHEQUE TO BE MADE IN WHICH NAME. I HAVE THE ADDRESS OF THE TEMPLE.MY FORFATHERS NATIVE PLACE IS VAIKOM. PLEASE SEND IN YOUR REPLY EARLY. Om Namashvaya...... Please inform me the available dates for Prathal during April-2014 with rate also.... I am sending this from Dubai. Could you send me the price for chuttuvilakku vazhipadu please ? Sir, Ohm Namasivayah... I want to perform a PRATHAL vazhupad ,please give me the guidelines for it.rate how to book and all the things related to it. Visiting this site for the first time. Like the lay out and the information provided. Nothing related to Ashtami has been mentioned in the NEWS section.. Kindly update the start & end dates in NEWS section so that devotees can plan accordingly. Also can highlight the dates in the calendar which is displayed on the Home page.. Thanks a ton. Sir, kindly send me the phone number and Email id. This year's ashtami date is mentioned as December 9th instead of Nov. 26th in Kerala Govt. Calender and in some websites. No phone number is available to contact the temple? Pl. publish all the details in web clearly so that no one face any difficulties. Can you please let me know the contact number of Temple office? I wish to offer Swayamwarapushpanjali on a particukar day for seven months starting from the month of Thulam. For Swayamwara pushpanjali, what is the amount to be required to be remitted to the temple? we are a planned a trip to sabarimala on 17th November, 2013 the same day please permit us one double room. Namaskaram, I would like to know more about the Prathal. Please let me know whom should I contact. Thank you! I would like to know whether Uma Maheshwari Pooja is offered tgere. If yes I wanted to do Uma Maheshwari pooja evry month. Details would be given once confirmed that these Pooja is available there and chanrge and how can I send money . Please tell me the various poojas and donation. My father Mr.Shivaramakrishnan from Bangalore used to donate for poojas. But now he is not alive hence I do not know any pooja and other details. Please let me know the email id of the Vaikom Sree Mahadevar temple. I have to do some offerings and request this information. I am working abroad. Hence, this request. Pls let me know the email id so that I can contact them and do the needful. Thank You so much, I am sitting here in a foreign country could feel so much grace when I was going through the site. Sir, I need to make Puja-archana in Vaikkathappan Tunai, Temple as it happens to be our Kuldevatam. I am from Jamshedpur, Jharkhand. I want to know that when I am in coimbatore in September,this year, how do I reach this place? Kindly help me with a proper route map or reference who can take me to this place. Very good site - All Vaikom people like me will like it - Thanks to the sponsors too. I am very fortunate to call this wonderful town my hometown. Visiting the temple always gives me a sense of peace. No matter where I am or what I am doing, I always start with Vaikathappa Sharanam. Hopefully will be able to attend the Vaikathashtami again in the near future. Hi, I am a bharatanatyam performer from mangalore and read about the temple from your website. I will be happy to perform for one of your temple festivals, if given an opprotunity. Please let me know if this is possible. Thank you. Radhika. What are the hours the temple is open? OM Namahsivaya! I had the good fortune of visiting the temple 40 years ago. We would like to participate in the on going Kodi-Archana. There is no contact no given in the website; as such we are unable to contact or ascertain the details for remitting the amounts for various poojas mentioned under the the NEWS item. This special pooja is happening only once in 12 years which we learnt through news channel.We request for contact tel No of Temple Devaswom. Thanks/Regards Gopalakrishnan. Sir, I need clear address at vaikom mahadevar temple. naranai ingane janichu bhoomiyil ........... naraka varidhi naduvil njan . narakathil ninnum kara kettidenam ...... thiruvaiom vazhum sivasambo.... annadhana prabhuvaya thiruvaikothappanu kodi kodi pranamam. Dear Sirs, I would like to remit money towards Kodiyarchana via e-transfer to your account. Can you please send me your e mail so that I can give you the details. Thanks. Respected Devotees, Why there is no e-Hundi for distant Bhaktas for their prayers?. This is my humble suggestion. Computer Engineer from Thuravoor,Anand Bhavan, Thandappally. With Prayers to Lord Shiva. Please send temple's email id. Can i Get prasadam ,moneto, photos by posT. I am delighted to see this site and got many things like hyms & bhajan. Like to see many video galleries also in this site. Please arrange to upload different video galleries of Ashtami as well as coming Vadakku purathu pattu. Namaskara. Please provide address, contact number and email id of the temple. Thnaks in advance. Sir, Can I do advance booking for Prathal by sending a cheque. Please let me know the available dates with timing in March 2012. Please let me know the temple timings. When is the abhishekam done. We are looking to the day-t0-day program of Kodi Archana & Vadakkupurathupatt, so that we can book rly.reservation to reach and get Divyadarshanam. Program not yet displayed. Please make conveniently. Sir, I want to give contribution for Annadhanam. Kindly let me know the procedure. To the creators of the website- well done. Could you please upload the videos and pictures from this year's ashtami? especially the sribali videos. this year's panchavadyam was amazing with all the kids and elders making a celebration out of it. would be lovely to revisit it in videos. thank you. OM NAMA SIVAYA This site helped me to know about the temple. I am from kozhikode . Thanks. We are basically from Madurai but our kuladeivam is Vaikathappan. We are very keen to offer donations on a regular basis to seek the blessings of our family deity. Kindly provide an online facility for the same and for booking of seva/poojas. Kind Attn : Admin Dept. VaikomTemple Devasthanam Sir Can we send donations for Annadhanam happening at Vaikom temple at Ashtami(Bairavashtami). I am residing at tamilnadu, if u give any bank a/c. no. or online payment system, and if it is allowed i want to donate for annadhanam happening there. Bhakthipradham...... Thiru Vaikkathappan Saranam !! Good web site. If pooja timings are also included, it would be great useful. I am physically in Chennai but I believe to be in this temple. I wish I should visit this temple atleast, emphasise atleast, once in my life time. Website is very good &informative. Pl.include more details like ANNADHANA TRUST. kinldy,send the details milk abisekam and how much we have to pay for that.We can do any day or we have to book for that. whether the temple is opened on saturday & sunday? I am a regular devotee of this vaikatappan and when ever i visit my family at vaikkom visitng this temple. Through state bank of Travencore there is a chance to trancer offerings online to Guruvaur temple. Like that if the same facility extendents to this temple also it is very useful and we can make offerings. Instead of sending DD it is easier to make online offerings. Please look into it. I am very happy to write here.Your site surely attract more devotees to the temple.I think it is better if it include more video.I will come to Vaikom soon. I heared about this temple, It's very old and famous temple. So I'm planning to visit this temple. Grihaturatwam unartunna ambala muttavum omkara nadavum thiru sannidhanavum....aa tiru natayil picha vacha naal muthal sumangaliyayi padiyirangiyatu vare oorthu pokunnu...oru pravasi nira kannukalum kooppu kaikalumayi ninne namikkunnu, VAIKKATTHAPPA!!!!! Have not actually been a guest yet, have been to South India but not to this place. I am planning to visit here early in 2013 and would welcome any information.Thank you. Annadhana prabuvinu ennum adiyante hridha dhara..
My wife and I would like to visit this well known temple and to see the famous murals especially - which are said to date to the late 1800s. I have images of the murals from books, but would like to see them for myself. We will likely be there on 28 Jan. We are situated in Auroville (Sri Aurobindo and The Mother) near Pondicherry. Kindly make arrangements to receive offerings through money order, so that people from other places can also do the offerings. Your website is divine, beautiful, informative and excellent. Indian Vedic contribution is a reservoir of Vibrant Information and Harmonious Creativity. May the womb of nature embrace all with tranquil blessings from this day forward? Let this attract one's attention affecting them positively. It is a sanctuary of the self a creative venue which serves as an enduring expression of lightness, where a peaceful atmosphere with sunlight flows and serene atmosphere prevail. Hello sir, I would like to know the details for choroonu ceremony. Is there any specific timing for the ceremony? please give me the offical temple address for communication sir. I want a help from your side. My son Mastr. Rohit Krishna wants to do the Arangettam in Karnatic Music during the period of Ashtami. He already applied for this. But so far nothing hear from your side. The full address is : Rohit Krishna, S/o S.Sivaramakrishnan, Krishna Priya, Temple West Road, Perumbavoor. Please look into it and inform at the earliest. My telephone Number: 9846105567.
i need the contact number of brahmana samooha madam east nada. Kindly inform. I visited this great temple on 23rd October 2011. We could visit Ettumanoor, Kaduthuruthi & then Vaikom. My wife got "Vella Naivedyam" and I took this rice to cure my stomach ailments. I felt like meeting my own father or visiting my ancestral home and leaving the temple premise was painful moment. There is a great spritual magnetism & vibration here. Sambo Mahadeva. i want to do archana for my daughtereverythursday.if i sent money through post can u please do the needful and send prasadam. i am from trivandrum.i tried to phone but no body is pickg. 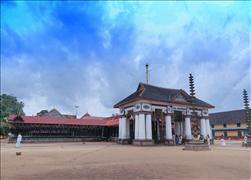 which is the oldest temple in Kerala pl? Dear Sir, could you let me know when the Vaikathu Ashtami will be held in 2011? My parents would come from Europe to attend. Thank you. I am happy to view the website of the Vaikom Temple with devotion to the Lord! I greatly appreciate the initiatives taken by all concerned. Kindly update the information since 2009. Kindly include more videos for outstation devotees. Contact details such as phone Nos of the Guest Houses/Tourist Homes may please be collected and included. My deep pranams to the Great Lord with profound gratitude!! Thanks!! Respected sir, i am residing in srirangam,and i want to know whether there is any special pooja to get relieved from stomach ache . i need the detail, how to guide me the dharsan priority, first,second & third..... i hope in same day, the dharson must made? please reply me, i have to come from Hosur, Tamilnadu....route map more helpful. 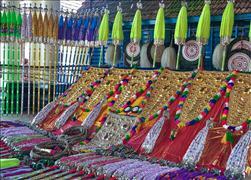 I want to know any amman temple in Vaikkam. Can u help me because amman temple in vaikkam is our kuladeivam. CAN U PLS LET KNOW THE CONTACT NUMBER OF YOUR TEMPLE. I belong to 1969-74 M.B.,B.S. batch of Kottayam Medical College.Just a couple of days prior to my I MBBS examination I fell ill and was unable to read.My prayer to Lord Vaikathappan was to see me through only one of the three subjects at least On the final day after the practicals (june-during heavy rains) I walked from Arpookara to Vaikom Surprisingly on my return I found that I had passed in all the three subjects. Om ! Namasivaya, the website is very good, I want to do a pooja abisheakam how to contact kindly give the phone number. I LIKE TO BE ONE OF THE DEVOTEE AS MY WIFE BELONGS TO VAIKOM AND BEING A RESIDENT OF VAIKOM FOR SEVERAL YEARS AND I WISH TO HAVE ABUNDANT BLESSINGS OF SHREE VAIKATHAPPAN AND PRAY FOR SARVA JANA PROSPERITY. The ancient Hindu philosophy of keepiing mind and body for the well being, has entered the managerial, medical and judicial domain of the world. it is very useful to every people, to know the manthras of lord siva. and please update the every festival dates as early as possible. Sir, Please let me know the darshan timings (Temple open timing) at the temple on normal days. Very nice to see this web. thanks for this creater. I would like to stay in Vaikom near the temple and attend all the poojas for 3 days. Would like to give some vazivadu and could I get some reasonable tariff for stay in Vaikom. vaikom ashtami tirukodiyetty on NOV 18 2010 .we are comming to vaikom on 26-11-2010. It would have been very convenient if the contact details of the temple administration was provided in the site. Vaikathastami is on 29th Nov. 2010. Hope that Astami Program will be made available in this site. Its very good , and looks like very attractive to every one. Very elegantly prepared site. If the contact details of (Phone Nos,e.mailID etc) the temple preiest & administrator etc are given it will be convenient. Nice to see this website!!! I want to know the timings for Tulabharam. Can you please provide the contact no? I want to get the contact No. or the name of the person to whom I should contact for Annadhanam. 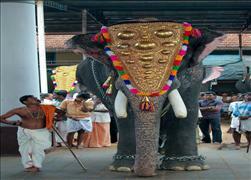 I am from Vaikom (Parickapalli tharavad) and frequently visit Vaikom to offer my prayers at Vaikom temple.. This description of Vaikom temple is very informative. I have never seen a better presentation on Vaikom temple.Congratulations and best wishes. It is such a joy to see and hear about the Great Lord Vaikkathappan. Very informative website. It is my wish to conduct my marriage at Vaikom temple with the blessings of the lord.. I am hoping my wish would come true... this website is very informative and interesting. Today, I happened to go through this site. The site is excellent. However, I have some suggestions. It will be useful if more information about the pujas being performed, like rate of various pujas, prathal etc. are also included. There is nothing much written about the kalakshetram where various art/cultural items are being taught. Thank You..Koodan aagrahamulla Ashttami viseshangal alpam websitilude kanan pattiyadil sandosham..Ashattami atrakkum nostalgic feelings tarunnu enikku.Karanam 3varsham Ashttamiyude stage announcer aayirunnu.adorikkalum marakkan sadikkilla. Thanks relay, Sailesh. Dear Sir, Can you please provide me with the contact number of Vaikom Temple. Will be waiting for your reply. Thanks. It is really good to the see the temple in website since i had visited this place in 1998. Happy to see the site. Very well made. this site is good and beautiful.at the same time would appreciate if more videos are shown about the daily pooja conducted on a daily basis and when special festivals takes place at the temple,the video would be of much help,information to all the devotees.also the various poojas that are conducted at the temple,its prices so devotees can book for the poojas.also try to include more foto gallery of the temple,inside out. It is wonderful presentation about Vaikom Mahadevar Temple. Kudos to its sponsors. Never expected such a site in Wikipedia about Vaikom. I belong to Vaikom, Udaynapuram, hence so thrilled to see it on net!! Keep it up. Please publish Ashtami daily program schedule. 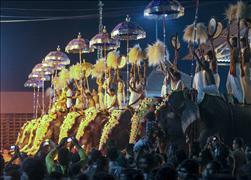 A scanned copy of utsavam program booklet will be nice. My special prayer on the occassion of my sisters prathal at the holy feet of lord mahadeva. Please give the temple vazhivadu counter telephone numbers and also the vazhivad that are performed in the temple. Om Nama Shivaya!! Great web site.. Our family is associated with Vaikom temple for almost a century.. I'm in Oman now & thanks to this site I am blessed to have Vaikathappan's darsan from here.. The site takes us to the temple mentally.. Let Vaikathappan's grace be upon all those behind this noble venture!! Om Nama Sivaya! I want to send a l DD for a small puja. so please let me know the DD in favour of whom and the exact temple address. Very nice website, much informative to all especially for pilgrims. it will be much better if you could put videos on ashtami festival. Please try to make online facilities for offerings. It may help full for those who live in outside Kerala. Really I am very happy to know that the temple has its own website. The website has got enough information for a traveller who wants to visit the temple. I really take this opportunity to congratulate the people who put their efforts to develop such an informative website to aid the devotees. I am currently working in Kuwait and planning to visit the temple during my next arrival in Kerala (May-June 2009). Thanks for the valuable information. The site created is beautiful. However, it would be more appropriate to give the detailed address and telephone number of the Guest House accommodation, to facilitate Piligrims to contact the authority and gest their accommodation reserved and have darshanam of Lord Shiva comfortably and seek his blessings. Hope this will be added during the time of updating the information. It is such a joy to see and hear about the Great Lord at Vaikom. Being at Vaikom Mahadeva Temple is a joy beyond words. The Pujas , the dfferent Roopas of the Lord are a treat for the devotee. The sponsors and the people responsible for the site have done a great service to the uncountable number of the Great Lord's devotees. Oom Namah Sivay. Om Nama Sivaya Thank you for creating a site like this, i am living in RSA Because of that i cant see the temple live but now i can see in hear, i like to see more pictures and videos, if u can please send to my e-mail , once again i am thanking you for creating and maintaining this site. ENTE VAIKATHAPPA NJAGALE KAATHU KOLLENAME. Can I have the phone number of the temple?? om namasivaya,its a great plesure to view ds,my hearty thanks 2 d sponsors & d people behind dis.MAHADEVA will bless u.
I FEEL THIS SITE WILL BE OF MUCH IMPORTANCE TO THE PILIGRIMS VISITING VAIKOM AS THEY WILL BE ABLE TO KNOW ABOUT VAIKOM MAHADEVA KSHETRAM AS WELL AS OTHER TEMPLES NEARBY.I THIK WE THE PEOPLE OF KERALA SHOULD BE PROUD TO HAVE SUCH AN IMPORTANT TEMPLE IN SUCH A BEAUTIFUL PLACE OF SCENIC BEAUTY. Indeed devotees are indebted to the sponsors of this page for the excellent manner in which most valuable information about VAIKOM SRI MAHADEVAR TEMPLE is presented. OM NAMAH SIVAYA. Beautiful site.... good info on Vaikathappan... Being a peson from vaikom m proud of this venture of yours. Very good site.......informtive. Will visit the temple and seek blessings of Lord Mahadev (Vaikattappan). it is realy good.i have request about your route map, nearest railway stations an km .please include the gif animations.upgrade is very important.include photographs more insert melsanthi's an thandri's photos. Vaikom is my hometown. Came there for vacations often and every time we approached Vaikom and first saw the nada, I felt that I had come home and everything would be alright. This is the only temple that actually gives me a peaceful feeling. I guess that is because of Vaikathappan. It's been a wonderful effort by whoever behind this. It helped people like me who are born and living far away from this temple to know about everything of this famous and ancient temple. website looks good. i have one suggestion. Please need to include suburban temples and festivals which was held on there. Please do needful action ASAP. Really valuable work. 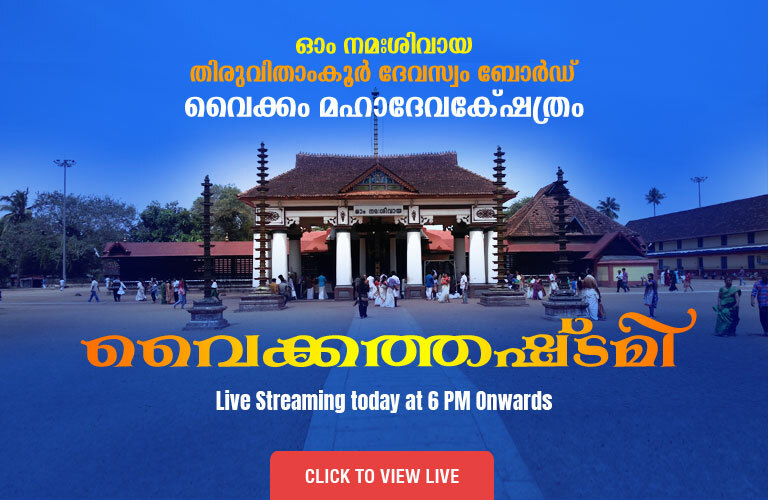 This will be very much helpful to those people who are from vaikom and staying outside Kerala or India to be in touch with vaikom temple and to know about the news happening there. Regular updates expecting….!!! "OM NAMA SIVAYA"
Ohm! Namah Shivaya..... Hats off to those people worked behind this fine venture.Because it is a much needed one. Yet this is one of the ancient temples in Kerala, now only has own website.The intention and execution is wonderful.It's like a 'dream come true' for people like me. Well done guys...Thank you very much. Am a 10th std student, this year before I go in for my board exams i offer to this great temple as a devotee to lord Shiva to bless me to achieve the best in my life. Dear Friends, Its a great thing and you done it. Congrats... may this site helps lakhs of devoties out side vaikom. i think "where to stay" is most essential. best wishes once again. with regards, Vinodkumar.